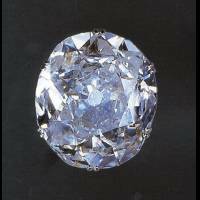 Originally a round stone of 186 carats belonging to the Indian Raj. Plundered in 1739 by the Shah of Persia, who called it "Mountain of Light" (Koh-i-Noor). Came into possession of the Engish East India Company, which presented it to Queen Victoria in 1850. Recut, it was set in the crown of Queen Mary, wife of George V, and then in a crown made for the mother of Queen Elizabeth II.